When your chakras are aligned, your spirit soars. 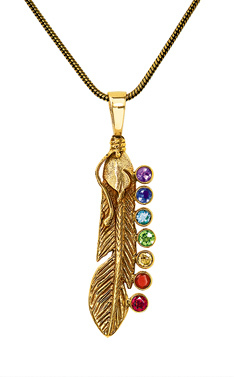 Seven semi-precious gemstones in the colors of the chakras sparkle alongside a floating feather in this inspiring hand-cast pendant. Brass; chain adjusts 18-24". Handcrafted in Nepal; fair trade.